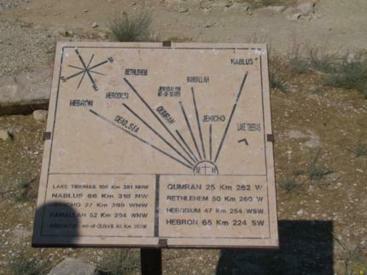 Today our journey took us south from Amman about twenty miles, to Mount Nebo and the town of Madaba. We passed through gently rolling terrain, gradually climbing to a height of about 2,500 feet as we reached the top of Mount Nebo. This is the location from where it is said that God finally showed Moses the Promised Land after forty years of searching, stretching out to the west before him. It is also on this mountain that Moses is said to have died and have been buried. The view from the summit is stunning, and provides a very graphic illustration of the importance of water in this arid land. A green ribbon that is the Jordan river valley paints itself across a landscape of deep browns. In the distance lies the Dead Sea, and beyond that the Mediterranean, both of which Moses could observe from this promontory. Moses was one up on us in this regard; industrial activity throughout Jordan and Israel has created smog which has largely obscured what Moses was once able to see in the distance. Clarity of vision is a precious commodity in this land, and seems to be diminishing on all fronts. Fourth Century Christians built a small church on this site, and over the next three centuries it was gradually expanded into a basilica. The location became part of a regular pilgrimage route in the Sixth and Seventh centuries. Pilgrims started in Jerusalem, continued through Jericho, ascended Mount Nebo, and ended their journey with a restorative bath in the natural hot springs at Hammamat Ma’in. Since our pilgrimage was conducted via air conditioned motor coach, we had to settle for showers in the hotel. We left Mount Nebo for Madaba, a town with a 4,500 year history, and the home of the Moabites of Biblical times. Here we visited the Madaba Handcraft Center. This is an impressive undertaking managed by a Jordanian entrepreneur who divides his time between Madaba and Cincinnati, Ohio. At the Handcraft Center young women learn the art of painstakingly recreating the mosaic designs for which this area is so famous, using small natural stone (called tesserae) found in the area, instead of ceramic tiles which is the more common basis for mosaic art. We stopped for lunch at a very popular Jordanian-style restaurant for an incredible meal of salads and bread. The architecture of the restaurant was worth the trip in itself, with its rough stone construction, open interior courtyards, and attractive furnishings. The breads arrived at the table in handsome hand-woven baskets still steaming from the oven, and were a wonderful accompaniment to the many spreads, dips, cheeses, and salads that arrived at our table in profusion. After lunch we visited the Greek Orthodox St. George’s church. In 1897 Madaba became an international sensation when a Sixth Century mosaic map of the Holy Land was discovered beneath the floor of this church during renovations. This discovery sparked a flurry of excavation throughout the area, which to date has uncovered well over 4,000 mosaics hidden under centuries of rubble aat various sites throughout the city. Tomorrow we begin a longer journey to the south of Jordan, visiting one of the famous Crusader castles (Karak), originally constructed to defend the eastern flank of the Latin Kingdom. This summer’s historical movie epic The Kingdom of Heaven sets much of its action at Karak Castle.